ISOLATE 100 contains 100% CFM whey protein isolate, which shows record biological value (BV 159), high absorption rate and BCAA and L-glutamine content. 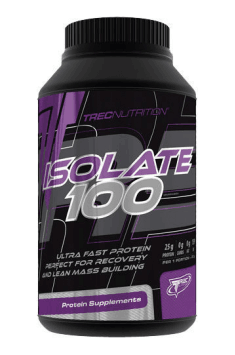 ISOLATE 100 is a strong trigger of muscle protein synthesis and, consequently, contributes to quick muscle mass gain. The product supplements your diet with top-class, fat-free and sugar-free proteins essential in developing athletic and muscular body without the risk of developing excess fat tissue. Cocoa powder for chocolate, chocolate-strawberry and chocolate-mint flavor; thickener - sodium carboxymethylcellulose; acidity regulator for pear and strawberry flavor - citric acid; flavors; emulsifier - soybean lecithin; sweeteners - sucralose; coloring agent for pear and cream-vanilla flavor - beta-carotene, coloring agent for strawberry flavor - cochineal red A.